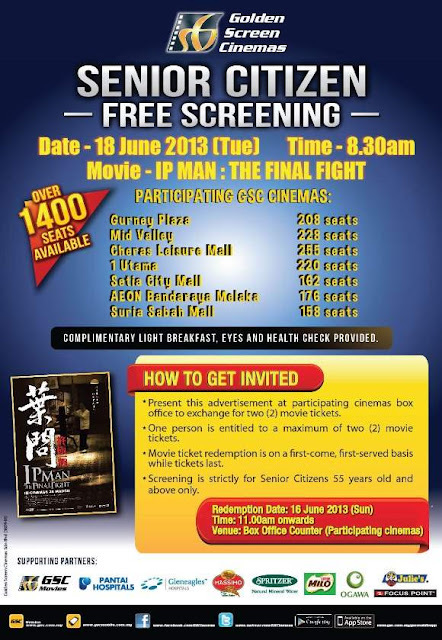 GSC: Senior Citizen Free Screening on 16 June (over 1,400 seats available)! FREE Screening of "IP Man: The Final Fight", specially for Senior Citizen. Comes with complimentary light breakfast, eyes and health check provided! Present this advertisement at participating cinemas box office to exchange for two (2) movie tickets. One person is entitled to a maximum of two (2) movie tickets. Movie ticket redemption is on a first-come, first-served basis while tickets last. Screening is strictly for Senior Citizens 55 years old and above only. LIKE & SHARE out this great giveaway ya!